This tablecloth is truly lovely for a non-fBric item. It's heavy and large too. Thanks! This tablecloth is lovely, much nicer than expected. It looks like a cloth table cover. I have been looking for one like this for years. It stands up to a home with four children & lots of company beautifully. I have bought this product before!! probably order the same one again. This is a really nice table cloth. Good quality. Exactly what I wanted. Wondereful, just as I expected!!!!!! Great tablecloth. Just what I wanted!!! I use this on the table that was used by parents as our family dining table. It's pretty and I like the cutouts in the design. It's very easy to wipe clean. The price is reasonable and I plan on getting the larger size to use when the table is expanded. These are great over a solid color tablecloth and very practical. I no longer get secretly upset when company (or family!) spills the gravy. It also saves washing the nice tablecloth after every meal. My only recommendation is to let the plastic cloth air out of the wrapper for a few days before use. This minimizes the "plastic smell" and helps to get the wrinkles out, too. Beautiful tablecloth! Helped protect tabletop surface and looked elegant for entertaining. No need top worry about spills and can be used over and over. Wonderful price. CERTAINLY GOT MY MONEY'S WORTH ON THIS TABLECLOTH. REC'D. MANY COMPLIMENTS. VERY BEAUTIFUL ON THE TABLE, EASY TO CARE FOR, JUST WIPE UP SPILLS. LOVE IT. I have purchase these table cloths for many years. I use them at least twice a month during parties or receptions. They are elegant looking and look lovely on any table. Big plus is they are stain resistant (except for mustard)and wipe off nicely. with much use they eventually tear on the fragile lace look but in general they hold up very well. These table cloths were purchased along with the round ones for use in a church for funerals and other occasions that require table covers. Beautiful tablecloth. Don't count on it to protect your table from spills, but it sure makes the table look good. So glad they have this tablecloth in stock. Use the tablecloth for everyday use and also for entertaining. Washes great on delicate. This table cloth gives the impression of having an expensive lace table cloth on the table. It is easily wiped clean. The white color goes with everything. This table cloth brightens the eating area. Very attractive pattern. A great item for the family table where there are a number of children eating. Clean up is fast and easy. It is very pretty and I can use any color decor with it. Beautiful tablecloths & great quality. "Not your mother's plastic table cover"
I purchased this vinyl table cover in anticipation of a visit from my grandsons. I wanted something pretty but easy to care for so we could enjoy our meals and not worry over spills. I had an opportunity to use it before they came and my guests were amazed to find it was easy care vinyl; their first impression was, that it was material! Very well made but I haven't used it yet. Purchased to use at church. I purchased 3 of these table cloths for our church and liked the look of them so much. I decided this year to purchase 3 more to use for our Sunday school functions. Easy to wash in the washing machine. I have purched this product many times in the past. .
have been purchasing this product for years. customer service helpful - shipping is on time. will buy this product again and again. This tablecloth is lovely for what it is. For the price the quality is quite nice. Very nice! Thick enough to handle everyday use. Looks great! Well worth the money. These are very attractive tables cloths and will be used by our church for funerals and special meetings where table covers are required. I have purchased many of these to cover round tables in our church hall, and they add so much when we use them for funeral receptions. Yes, they do hold mustard and tomato sauce stains, but so do cloth coverings, and occasionally we have to repair with tape some minor tears, but for the money they are an excellent investment. They look almost like lace coverings for a fraction of the cost, and clean-up after a reception is so much easier. I love the look of this table cover. It is not solid. Due to the pattern you are able to see glimpses of the table top. In my case I like this but I definately need a clear plastic overlay. Spills would be miserable to clean up without the clear cover because of the "holes" in the tablecloth due to the pattern. I am thinking of getting another since it is so pretty. 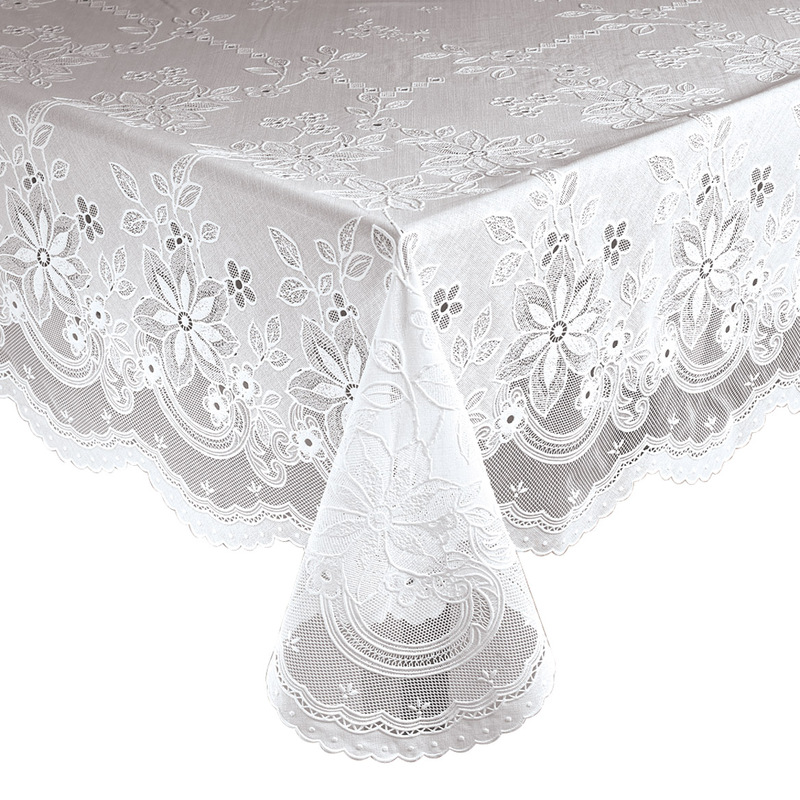 This tablecloth is used in my dining room, Love the white lace!! It is easily wiped with damp cloth! I have a little one around this comes in handy!!! Cleans easily. Can be washed in washer. It is for the diningroom table. Between the kitchen and family room. I was pleasantly surprised with how pretty it was in person. Fits my dining room table perfectly. I gave it a little tug to make the edges even and it tore a little bit on the lace part near the edge. But it doesn't show so I keep it on my table all the time. The tablecloth everywhere else is durable. The tablecloth worked and looked fine for the holidays. marlene with a need for bling! This is a lovely design vinyl tablecloth for everyday use. Wipe it clean and dry daily and it will last a long, long time. I do not recommend machine washing as it tends to shred the soft lining fabric. At these prices, I just buy a new one. The picture shown doesn't do this tablecloth justice. It's amazing! Friends have come over and had to touch it - really thought it was cloth. It's very elegant for a vinyl tablecloth! I will be ordering more. Bought two of these...60x90 and a 70" round...one for my dining room table and one for my kitchen (everyday)table. They look so much like a real lace topper for mytables and are protective too! I have 4 cats that sometimes like to lay on the table and look out the windows and it keeps all their fur off of my good linen tablecloths. I will buy these again, but I do wish that they were available in an off white or ecru color also!! But very happy with these and they look beautiful too! Looks nice on our oak kitchen table!!! Love it. Have ordered several different tablecloths from Miles Kimball and have been satisfied with our purchases. Arrived in a timely manner. I love this tablecloth. I have an open concept kitchen/dining/living and wanted something pretty, but simple for Christmas - something that wouldn't clash with my other Christmas decorations. Since I just have the one dining table, it needed to hold up to my grandkiddos. It does require another cloth underneath to protect or hide the table - I put a red or green sheet (easy to wash) under the tablecloth to add a tiny hint of color. I am very happy with this purchase and will buy another one for backup. I am ordering another one for my daughter. The tablecloth is just beautiful. It is a good weight and hangs nicely. I am ordering another one. Finally found vinyl table cloths!! These are for our church. We use them for funeral luncheons and the tables look very elegant. The product is easy to use. We have been looking for these to replace our old ones for a long time. it's the best thing I bought for my grandma's ( RIP ) old table that she gave me before passing, I have a picture of it that I would like to share with you ! I use these tablecloths in our fellowship hall at church. It is easy to wipe off. I find that it is very hard to get tomato sauce stains off the tablecloth. Used on my dining room table. I love this tablecloth! I've received so many compliments on it. It has the beautiful look of lace but wears like a quality vinyl tablecloth. I haven't tried washing it in the washer yet only because out of habit I always use a clear protector. It hangs beautifully like real lace. Very soft, not stiff at all. It had wrinkles from the folds but those came out very quickly and easily with a thin towel over it and my iron on a low setting. You won't be disappointed! I find it a great product for the table that is often shared by my great grandchildren. Spills are easy to clean up and no one has to get upset if the children are messy. Very nice touch to the tables at church! These are used at the Church for our dinners and banquets. They look very nice and wipe off easily. The Church Hall was in need of table covers so each ministry would not have to purchase different table clothes each time we had a function. Now, there is not need to constantly waste money. We used the tablecloths at our church's St. Joseph's Day Table Festival. They made the room look magical. BUT...before we even got to use them - one of the ladies put them out on the cloths line to air out the strong plastic smell and three of them tore on the corners. Any suggestion on how to "fix" them? Looks very nice, is wearing wonderfully. Doesn't slip and slide off the table! These table cloths were used at a dinner honoring older ladies. Many of them thought they were actually lace & commented on how pretty they looked.Some even said they could not believe that the cost was so little & the table cloths looked so great! Thanks for helping us honor these special ladies! This is such an attractive pattern for a vinyl tablecloth. I only wish the company would have more choices in colors and more decorative patterns in vinyl to choose from. Please keep that in mind. The tablecloth is beautiful enough to use for special guests, but durable enough to use for family dinners. It looks like real lace, but is easy to clean and maintain. It's very delicate looking but I hope it will last a long time. I bought it for my mother who is delighted with it. I really like this table cloth. Unfortunately, I found a tear /cut when I took something off of the table. It's thin so you need to be careful when you place items other than dishes on it. I would recommend wiping red colored spills off right away. This vinyl tablecloth is absolutely beautiful. I have it on my dining room table for everyday use as it gives an element of elegance to the room. However, it stains easily and nothing that I have used has removed a pasta sauce spill on it. The tablecloth can be laundered in the washer on the delicate cycle, but I line dry it. If it had not stained so easily, it would definitely deserve five stars. I had been looking for a vinyl table cover for some time, but not finding anything that didn't look like plastic or had an elegant design. This cover is perfect for my table. It has a very nice floral design and looks almost like cloth but is easy to clean. I only wish it was available in more colors. we use ours as a dining room table cloth to off set our center pieces! It is an elegant contribution to our Ding area! I was looking for Battenburg lace but this is a nice substitute for my kitchen table. I first purchased this tablecloth several years ago for my round tables on my outdoor porch. I liked them so well that this time I purchased an entire case of them. We use our country porch like another room in the house and have it decorated with white wicker furniture and small round tables. I like having a functional yet inviting porch and these table covers fit the bill nicely. They usually get pretty dirty but I just throw them in the washer and re-use them. They do get torn by the Kansas wind after awhile, but they are reasonably priced so I throw them away and and open a new one. They make the porch functional yet elegant! I get many complements at how pretty the porch looks with my decorated tables. AS I said before, I love the pattern and I would purchase another. It just needs some sort of clear, or color plastic liner to protect the table. I use the tablecloths in our Church Fellowship Hall for our monthly dinner. When bought on sale or with free or reduced shipping it is a wonderful bargain. I have stocked up for several years in the future. I bought 1 to use as a sample to show the VFW Auxiliary. They were like our old ones that have lasted 9 to 10 years. I will now be ordering 29 more. Our old one have been washed in the wash machine numerous times and are starting to look old. They are easy to clean and dry fast for us. They look nice and fancy with out ironing cloth tablecloths. The holes in the pattern allow liquids to go through the holes to the cloth or padding below. It is beautiful but has holes as part of the decoration. A glass with condesation will leak through to the table. I had to put another cloth underneath. I bought this tablecloth because we eat at the dining room table daily and I didn't want to have to wash a cloth tablecloth every night. 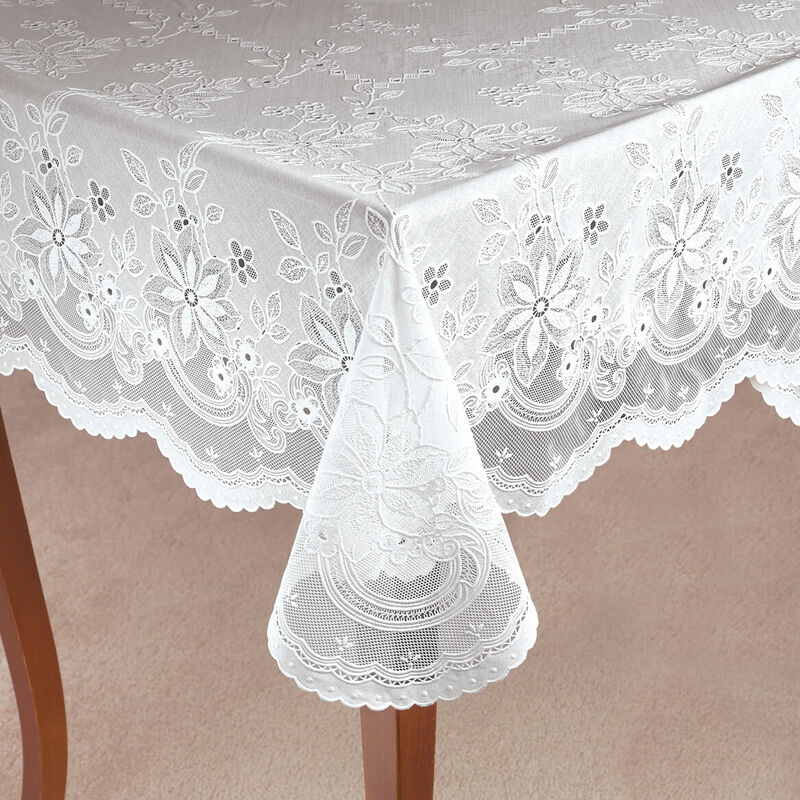 This tablecloth looks very nice (like real lace) and wipes off easily, but the holes in the lace pattern allow food and beverages that are spilled to get through and make contact with the table. I have to take it off every night to clean the tabletop! I had a similar vinyl tablecloth that lasted for 2 years (daily use, washed numerous times), but the "holes" in the lace pattern were not truly holes but clear vinyl which protected my table from liquids, stains and spills. That feature would make this tablecloth much more practical. I bought this product in order to protect my fabric tablecover. I wanted something nice but at the same time waterproof. Unfortunately by the end of the party I still had wine spots all over my beautiful fabric tablecover. Our church ladies aid was looking for table cloth to use for fellowship and funeral dinners. We had couple tablecloth to compare and we decided to go with other one. But we all say this look really Beautiful but other one look more dependable and it will last longer in our opinion. But I decided to keep this one for myself when I have nice dinner. I used?this product for my kitchen table to help prevent ware and tare of the glass surface. look elegant and easy to clean. This is an elegant looking table cover. It is best under a clear plastic top to protect it from food messes. i put this tablecloth on my nook table, the creases never disappeared and when i tried to move the cloth on the table, it ripped. it lasted right about 2 days. very disappointed with this purchase. Who puts holes in the top of a tablecloth? I bought this thinking the mesh parts were only around the edges. Who on earth would make a table cloth with holes? It's supposed to protect the table! I would have returned it but it was too much of a hassle so I had to put a protective tablecloth underneath which defeats the whole purpose! This table cover is very pretty, however it is very thin and not durable. It only handles light use (ie: use as decoration only) not a large dinner party as it tears easily. Stains very easily. Stains will not come out, even with bleach and lots of scrubbing. please do not send catalogs! please do not sell rent or trade my information! I have ordered this tablecloth before and it is beautiful! It looks like cloth instead of vinyl and cleans up well. Pretty lace vinyl for my dining room table,. company look alike. Probably owned by same. I have been looking all over for lace vinyl tablecloths. I received your catalog in the mail and I saw them in there. These go with our colors used during holidays in our church fellowship room-- it enables us to use different underlay colors, very lovely ..
Have used these types of tablecloths for years and have always been pleased with the protection for my tables and the looks are great. Like it because it is washable. It is very pretty and functional. This tablecloth looks elegant but wipes clean since it is vinyl. I need a solid white vinyl tablecloth for my craft table. For my daughter in law! She loves the look of the lace without the special washing! Just wipe clean, and looks lovely! Our church has looked for years for these tablecloths. We were so happy when we found them them at Walter Drake. The quality is superior. They look like real lace. for twenty years, which was purchased from Walter Drake. It is very nice and looks good on my dining room table. It is stronger than most of the vinyl lace cloths and lasts longer. I wanted a lacy-looking vinyl tablecloth for my dining room tablecloth. This looked like it just fit the bill. This is like one I have which is wearing out. Looked like what I wanted and reviews were positive. Will order more if what I need. needed white table cloths for beach house with lots of grandchildren. PERFECT! To go on the table used by my 92 year old mother. It is to replace one she inherited from her mother. why can I not read the reviews? BEST ANSWER: My review of this item is that I absolutely love it. I live with four men: two sons, my husband, and my dad, so the vinyl lace cloth looks lovely on the dining room table, but is so sensible. And at this price, so affordable. if you like to just wipe clean and walk away, this is the item for you. I bought 2 of these tablecloths in Jan. 2013. I am still using the same one. It looks beautiful on my kitchen table and is very easy to clean. Just wipe off with a soapy rag. I sue my dish cloth. If and when this tablecloth looks shabby, I will definitely buy another one. I bought the vinyl tablecloth a while ago and have been using it on my kitchen table . It looks just like lace. The only problem I have with it is stains that my husband spills on it. Some come off and others don't. Overall though , it is a good buy. I bought this tablecloth last year and it is on my table right now. It is very pretty and durable and it is the second one I have purchased. I would certainly recommend it to anyone. I am not sure why you can not read the reviews but I can tell you that I bought this and I love it!. I have a large family and it has lasted through allot. It is also very pretty. I can only say that I would not buy this tablecloth again. It's pretty to look at, but tears very easy. I have used this tablecloth constantly. It not only looks great, but you can clean it easily. Does this cloth have tiny holes in pattern?? BEST ANSWER: Yes it has holes. Being that it is suppose to look like lace, it should have holes. It looks like a fine lace tablecloth. On close inspection, you can see that it is vinyl, but frankly, I don't think most people take the time to examine a tablecloth that closely! Yes and if you place a colored tablecloth underneath even if its plastic, the color shows through. I do this for the bridal tables and put the brides wedding color under the vinyl one to highlight the table. Yes it does, make sure you have a table protector underneath, if you spill it goes right through. Other than that, it is very pretty and gives a nice touch to my dining table. Thank you for your question. Yes, this table cover does have tiny holes in its design. We hope this information will be of help to you. Yes - the center of the flowers are cut out. This is a very pretty cloth but crumbs can and do fall through to the table. Yes, there are holes within the flower centers and then there are some mesh like holes in the other design. I am looking for a smaller than 54 x 72 oval tablecloth- do you have it? BEST ANSWER: Thank you for your question. 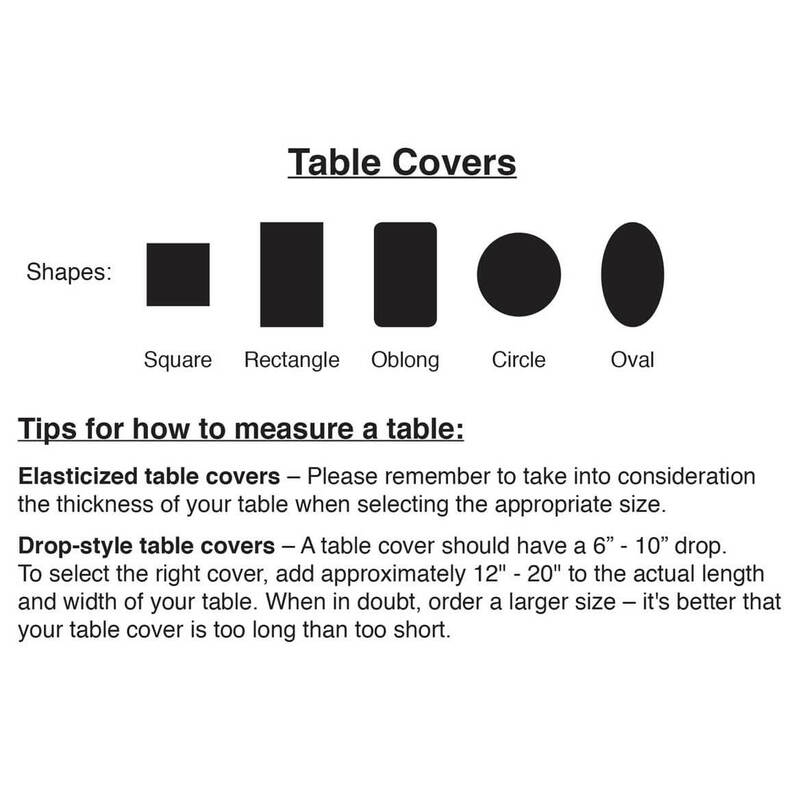 At this time we do not have a oval table cover smaller than the 54 x 72. We hope this information will be of help to you. Is this tablecloth white or ivory? BEST ANSWER: I would call it a soft white. Would these work over top of a longer polyester tablecloth in a color perhaps? We are designing our church hall and want to change out colors for season with polyester but want something to protect on top? Would the color show through the lace much? BEST ANSWER: The color would show through. You just need to know this table cloth is vinyl and there are holes in the pattern. If something spilled, it would soak right through. I put a clear plastic tablecloth over it and a colored tablecloth underneath. does it come in the color red? BEST ANSWER: Thank you for your question. Unfortunately this item only comes in white. We hope this information will be of help to you. My table is 48"by 48" what size should I buy? BEST ANSWER: The only choice for that small a table would be to get the 70" round, keeping in mind that the vinyl tablecloth will be a little stiff and will not lay relaxed on the corners. I happen to love a round tablecloth over a square table. It softens the look.